I finished my 15 Plaguebearers for the 40kFightClub.com 2011 Painting Challenge for this month. I got them finished yesterday afternoon. Unfortunately due to the time crunch of needing to get them done before today because I would not have any time to work on them today, I was not able to finish the tutorial that I started in my last post as I would have liked. Here is a quick summary of what I did for the rest of the painting. I painted the swords with Chainmail and washed with a thick wash of Chestnut Wash. The tongues and wounds were painted with Scab Red and Highlighted with Blood Red. The leather wrappings around the arms was done with Dark Flesh, Snakebite Leather, Highlighted with Bubonic Brown and washed with a thinned down Chestnut Wash. The bases were painted with Bestial Brown, overbrushed with Bubonic Brown, and drybrushed with Bleached Bone. It is almost the end of February and I just realized a couple of days ago while recovering from a pretty nasty illness that has made its way through my workplace that I have yet to pick a Painting Challenge project for this month. I have been sick for the last week and I am still recovering, so I need something quick and easy to paint. I looked through my stuff and found that I still had my last 15 Plaguebearers to paint for my Nurgle Daemon army. My painting scheme for these is pretty simple and fast, so I should be able to whip these out pretty quick. I really only need to finish five models for the challenge, but I think I can get all 15 done. That way, I will be that much closer to finishing off this army. 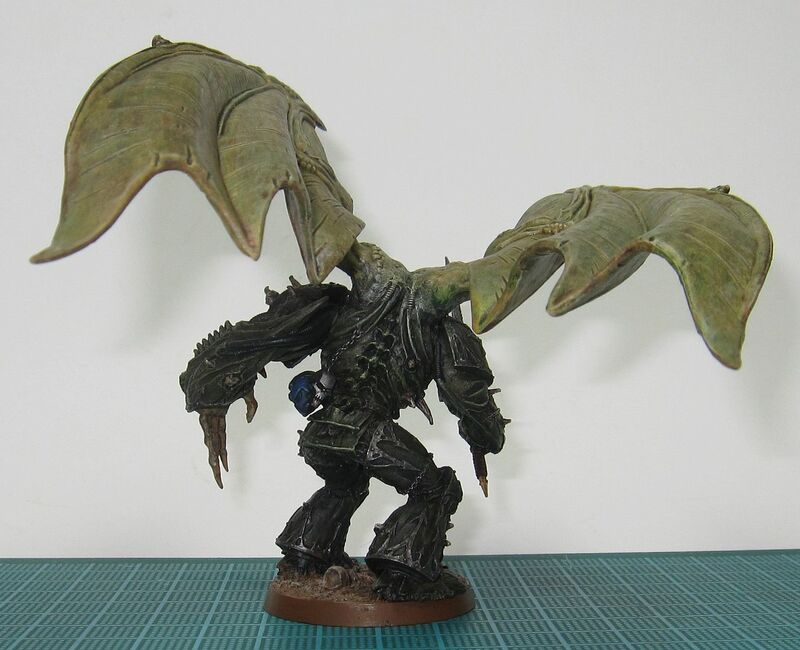 When playing my Nurgle Daemon army, I am frequently told that my Daemons look fantastic and I am asked how I achieve such an effect on them. So, while painting these for the challenge, I thought I would do a painting tutorial for them as I go. 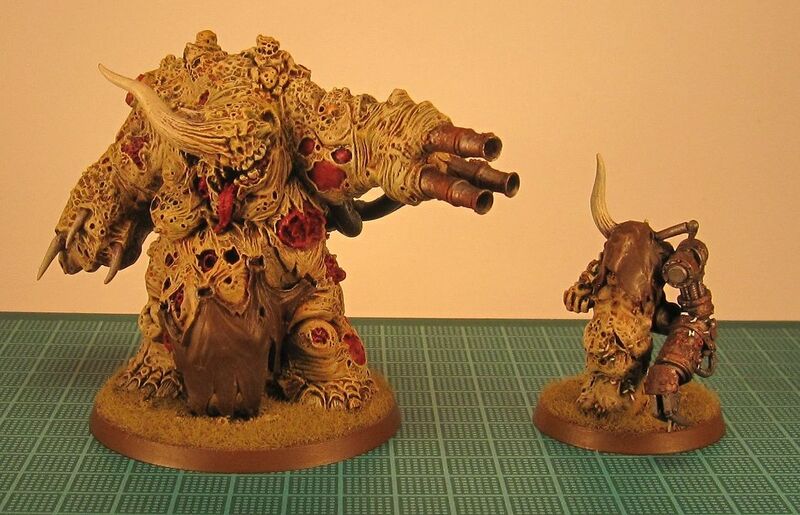 This is the same painting scheme I use on all my Nurgle Daemons, from Beasts to Blight Drones to Daemon Princes. Starting with a black primed models, base coat them with Bubonic Brown. The base coat does not have to be perfect and cover the model evenly. In fact, it works best if it doesn't. After the base coat is dry, thoroughly wash the entire model with a thinned down green wash. I vary the thinness of the wash on each model to try and give them unique looks, but I try to leave it a little on the thick side. Let dry thoroughly before continuing. Once the green wash is dry, overbrush the model with Bubonic Brown. Be sure to leave some of the green wash in the recesses of the model. Then, thoroughly wash with a thinned down red wash. Again, vary the thinness of the wash from model to model while leaving it on the slightly thick side. Once the red wash is dry, overbrush once again with more Bubonic Brown. Finally, give them a heavy drybrushing/light overbrushing with Rotting Flesh. That is it, all that is left to do is paint the details. Unfortunately, pictures do not do this painting scheme justice. When you look closely at the models, the green and red washes under all the overbrushings come through in some really interesting ways and gives the models a really sickly, grotesque look. Here are some other examples of models I have painted this way. I have assembled my Blightlord Terminators and my final seven Plague Zombies for my ToFG army. 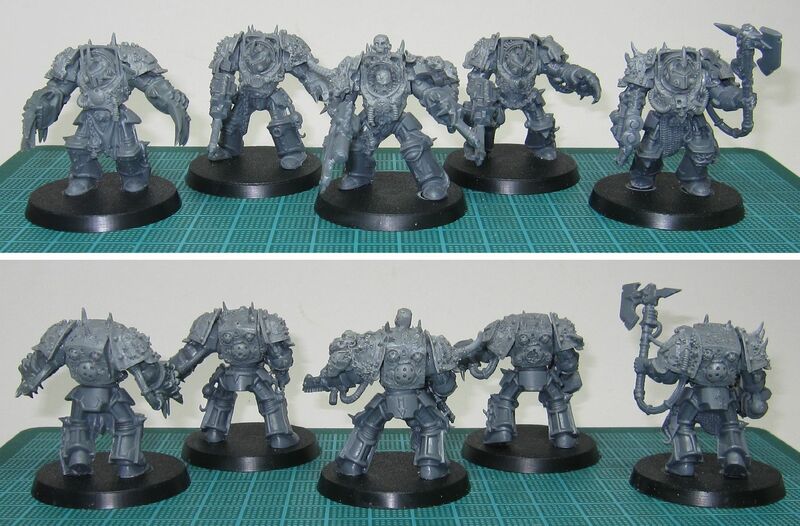 For the Terminators, I used the Forge World Death Guard Terminator bits, but I want to use some green stuff to Nurgle-ify the rest of the model and bring it all together. For my 'counts as Lesser Daemons' Plague Zombies, I just used the WHFB Zombies like I did for Period III, but this time I made two Zombies using some Cadian bits. I like them, but they they need some more work and green stuff on the Cadian bits to bring the whole model together. These are not the last Plague Zombies I plan to make. Once the ToFG is over, I can go back and make some more, this time using Catachan and Space Marine bitz. 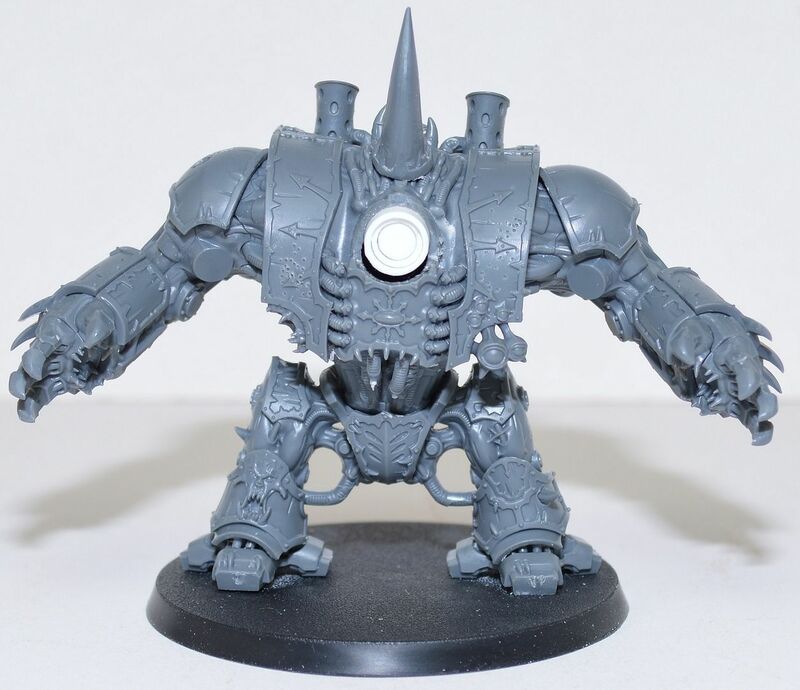 I have also assembled my Vindicator to the point where I can start to Nurgle-ify it and turn it into a Plague-spitter (a 'counts as Vindicator' that instead of shooting shells, it spits big globs of toxic goo), but since I have not started any conversion work on it, there is no point in just showing a picture of a partially built tank. An ancient race that has lain dormant for thousands of years, the Tomb Kings now awaken from within their ancient burial pyramids. Cheated from the eternal life that they were promised, the Tomb Kings are instead doomed to an eternal undeath - awakened they thirst for vengeance against those who would disturb their slumber. At the command of these undying lords march legions of implacable Skeleton Warriors, hosts of chariots crewed by long-dead crewmen and towering statues carved from unyielding stone. The armies of the Tomb Kings are vast, unstoppable hordes that know neither fear nor remorse - and they shall not rest until all who stand against them are laid low. This May Warhammer: Tomb Kings is released, containing everything you need to use the legions of Nehekhara in your games of Warhammer. Alongside the new book we'll also be releases a slew of amazing new miniatures for Tomb Kings players to collect and add to their armies. Details are being kept firmly under wraps for now, but more details will be available over the coming months. To make sure you're the first to see the new models and read the latest news keep your eyes fixed to the pages of White Dwarf, the Games Workshop newsletter and the What's New Today blog. In the meantime, if you're a Tomb Kings player (or thinking about becoming one) it's time to start building up your Undead hordes in preparation for the new arrivals. So, out with the large drybrush (and the pot of Bleached Bone) and onwards to glory! Presented below are two exclusive sneak peeks at the upcoming releases. Please keep checking back on the website, and in White Dwarf for more information in the near future. Last thing I need to be thinking about right now is another army, but last year when I was trying to decide on a Warhammer Fantasy army, Tomb Kings was one of my top choices. 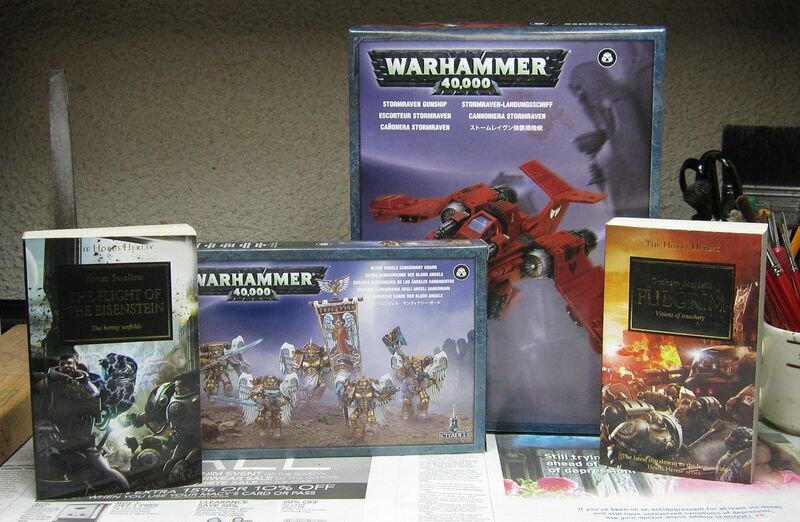 Everyone I talked to about them told me to stay away from them because they were bad and there were rumors of a new army book at some point, thus Ogres won out. However, I am still interested in them and I am curious about what this new army book will bring, so I will be watching the rumor mills. 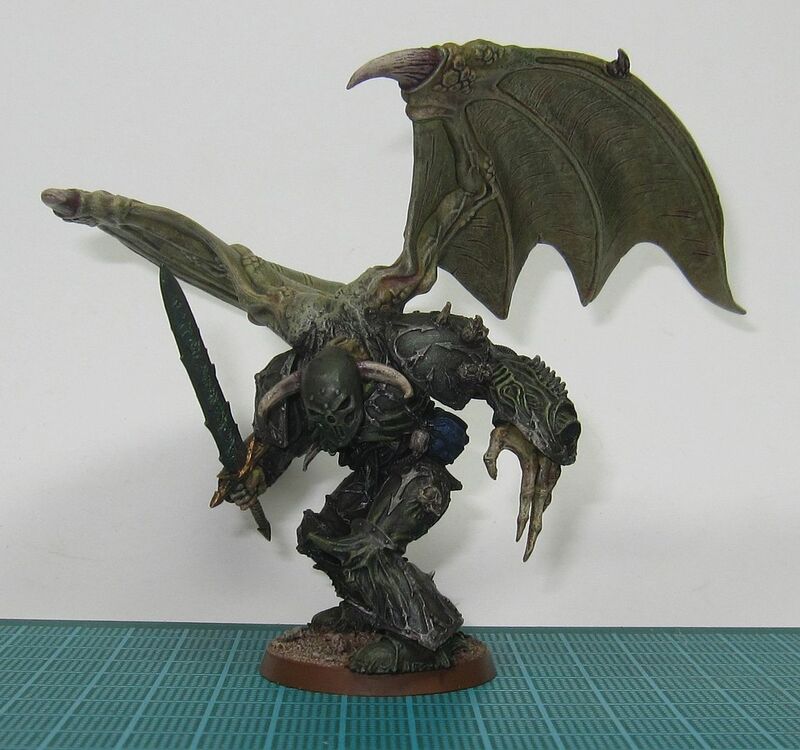 I completed my January project for the 40k Fight Club 2011 Painting Challenge, a winged Daemon Prince. Not my best work, I was rushed in getting him finished before the end of last month and was up late Monday night finishing it. So I was not able to take pictures until last night. It turned out good, although I can see a lot of things I missed.